3 Quart or 6 Quart Instant Pot - Which one should I get? 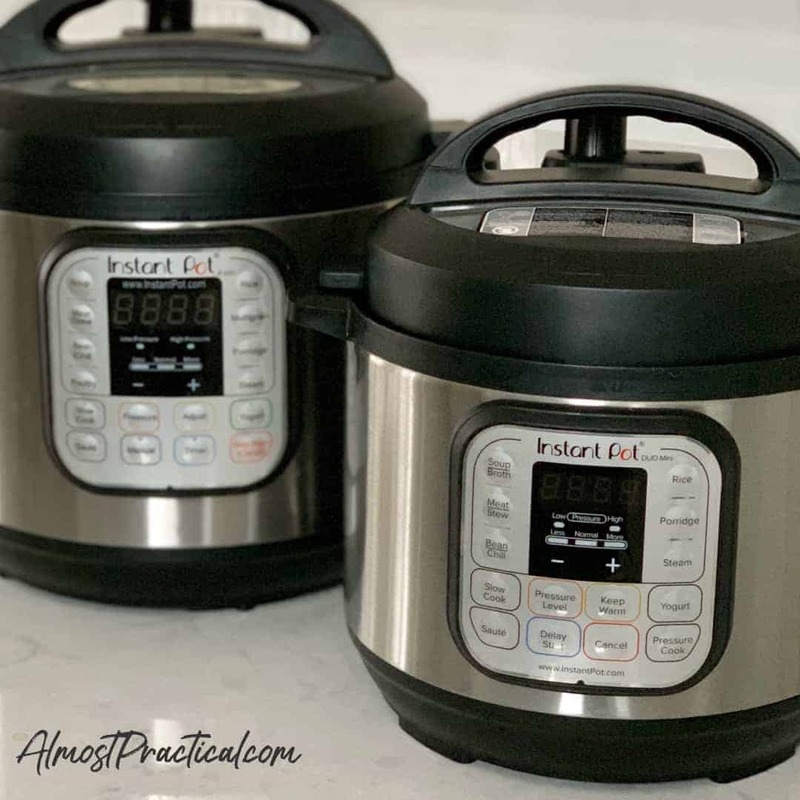 3 Quart or 6 Quart Instant Pot – Which one should I get? It can be difficult to decide whether you should buy a 3 quart or a 6 quart Instant Pot, especially if you have a small family or are cooking for yourself. I originally bought a 6 quart Instant Pot DUO60 a few years ago as an upgrade from a standard stovetop pressure cooker. The Instant Pot was very impressive in all that it could do – if you are not familiar, you can read my Instant Pot review here. I liked it so much that I actually bought a second 6 quart Instant Pot (which my son now uses) and when the 3 quart Instant Pot came out, I bought that one too. As an owner of both sizes, I can give you a little food for thought (yes, bad pun intended 😉 ). Before you buy an Instant Pot, there are a few things you should think about. I am going to list these in completely random order because I don't really think that there is any one factor that is more important than another. You need to decide which ones are most important to your situation. How much storage space do you have in your kitchen? The 3 quart Instant Pot definitely has a smaller form factor than the 6 quart model. If space is limited in your kitchen, I would measure the space where you plan to keep your Instant Pot and compare it the measurements of the actual Instant Pot itself. The last thing you want to do is store it in the basement or someplace far away from where you cook, because you will be less inclined to use it. Some people just keep their Instant Pot right on the countertop. But if your countertop space is limited as well, then this may not make sense for you either. Personally, I use my lower corner kitchen cabinet to store both of my Instant Pots. If you have a family of four or more – I would say that the six quart Instant Pot is a safer bet because you want to be able to make enough food for the entire family. There are 6 people in my family, and I got my 6 quart Instant Pot when they all lived at home. I found it to be very adequate for our needs. There is a larger 8 quart size Instant Pot, but I never felt the need to get one that big. So, you would think that if you had a smaller size family – say 1 to 3 people, that the 3 quart Instant Pot would be the best size Instant Pot for you. While the 3 quart Instant Pot is a good size when cooking for 1 person or a small group it limits the amount of flexibility you have to make larger or more complex recipes. It may also be harder to find Instant Pot accessories that fit into the smaller 3 quart model. Remember this – you can always make a smaller quantity of food in a bigger Instant Pot but you can't make a larger quantity of food in a smaller Instant Pot. For example, let's say that you wanted to make a large batch of soup so you could eat some now, have some for leftovers tomorrow, and freeze the rest. The 3 quart Instant Pot might be too small for this task. Or let's say you want to make multiple dishes in your Instant Pot at once using something called a pot in pot method. There may not be enough space in the 3 quart Instant Pot to do something like this. Given a choice between a 3 quart and a 6 quart Instant Pot – personally, I would choose the 6 quart Instant Pot assuming I had enough kitchen space to store it. For me, the flexibility of making larger quantities and the availability of a wide variety of accessories is very important. But keep in mind, this is a very personal decision and the factors that are important to you may different than the ones for me. Which Size Instant Pot Did You Choose? 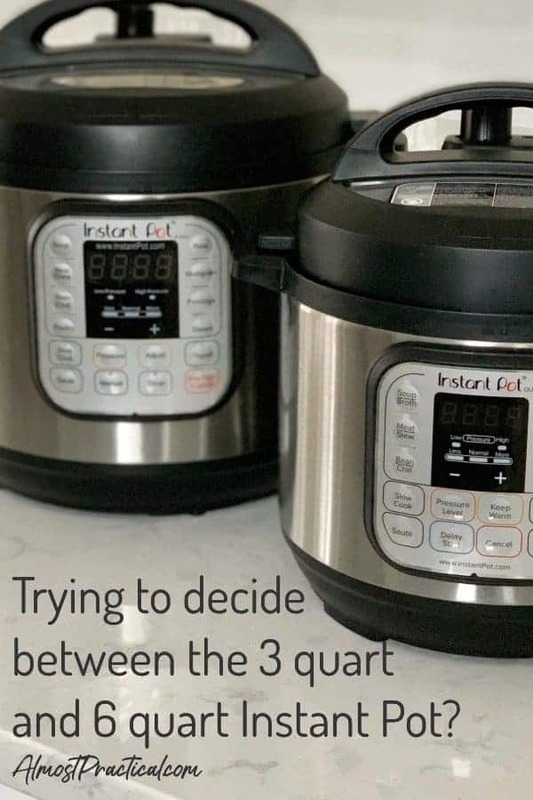 If you were on the fence between the 3 quart or 6 quart Instant Pot – which size did you end up choosing and why? Please let me know in the comments below. Why is my Instant Pot Rice Gray?